Update: If you’re watching this in 2016, remember this year’s GA is in Columbus, OH. 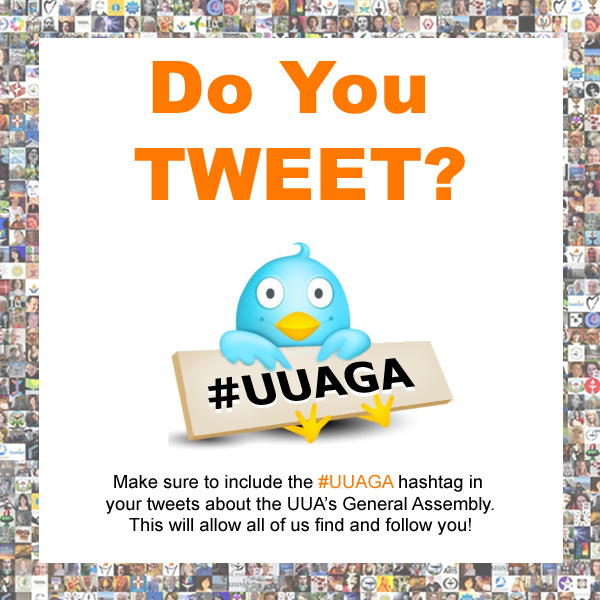 Friends, I told people using the UUA’s mobile General Assembly event app that I’d make a quick tutorial on how to get started on Twitter. Here it is! In this video I walk you through the process of setting up a Twitter account, connecting with UUs on Twitter, and a few basics on hashtags. This is not a comprehensive training, it is just intended to help you set up a Twitter account before General Assembly. You can learn during GA and in the #UUsGetSocial workshop series. I look forward to seeing you in Providence, RI next week and on Twitter. Once you’ve created your account, make sure to follow me at @UUPLANET. I will also be announcing new UU social media events for the Fall shortly, ranging from Colorado Springs, CO to Providence, RI. Friends, we are working on creating a multimedia piece for Sunday morning worship at General Assembly to the reading “Beatitudes for Justice Builders” by the Rev. Lindi Ramsden. Do you have photos to contribute? Please share them with us by this Friday, May 16th. Logistics and copy of the reading are below. Our vision is to create a visual presentation that is colorful, creative, fun, and moving. In addition to being part of worship at General Assembly, if all goes well, this piece will be available after GA for congregational use. Email: For one or a handful of photos, please email them to us here. If you use Flickr and have lots of photos to share (more than 5) post them to the UU Stock Photo group and letting us know via email that you’ve shared them there. If you use Dropbox, email Peter and he can share a Dropbox folder with you. 2. Photo size: Photographs are going to be included in HD video presentation at 1920 x 1080, so please only share photos at that can resolution or larger. 3. Please only submit photos that you have permission to share online or that are already publicly available online such as on congregational Facebook pages. We do not want to spend time hunting down photo permissions and so prefer images already online. 4. In sharing photos with us you are granting us permission to use them in the multimedia piece at GA, which will be live streamed, permission to use in an online video, and affirming that you have permission of people in the photo to share it. Permissions are not needed for photos taken at larger public witness events. Not sure if you have the okay to share? Please do not share with us or ask those in the photo first. 5. Please include the names of photographers to include in credits. We will be sharing names of contributors in a slide at the end of the piece. 1 Blessed are you who can question your own assumptions and listen with an open mind; you will receive new insights beyond your imagining. 2 Blessed are you who build friendships as well as justice; even when you lose an issue, you will have strengthened the foundation of your community. 3 Blessed are you who take delight in people; you will not be bored in meetings. 4 Blessed are you who agitate the placid waters of complacency; you will create waves in the inertia of privilege, and will know the thrill of riding the surf of change. 5 Blessed are you who lead with enthusiasm and confidence, resisting the temptation to shame the apathetic or self-absorbed; you will inspire curiosity and hope in others. 6 Blessed are you who play as well as work; you will have more fun, build more energy, and will draw the powers of the impish to your cause. 7 Blessed are you who ask for help in your role as leaders; you will find teachers at every turn, and your work will remain interesting and alive. 8 Blessed are you who do not demonize your opponents; your eyes and your hearts will be open. 9 Blessed are you who sing and dance; you will find energy and joy to lift you on your journey. 10 Blessed are you who offer thanks and praise five-fold for every critique; your children will want to visit after they are grown, people will want to serve on your committees, and friends will be interested in your opinions. 11 Blessed are you who study the rhythms of history; you will have knowledge with which to shape the future. 12 Blessed are you who work in coalition rather than in principled isolation; you will meet great people, learn things you didn’t realize you needed to know, and have partners for the journey when you are in the lead, or in need. 13 Blessed are you who discover, train and encourage young leaders; you will see your work expand and grow beyond your own time and talent. 14 Blessed are you who can change your mind; you are still alive. 15 Blessed are you who will not let the perfect be the enemy of the good; you will see progress in your lifetime. 16 Blessed are you with an active spiritual life; you will find perspective and comfort in times of loss and betrayal, and will rise without cynicism to meet the challenges of a new day. 17 Blessed are you who live from a place of gratitude; for you will know the meaning of Life. We’ve discussed the issue of UU clergy vs. lay person blogging in the UU Growth Lab and most agreed that the ease of sharing ideas and engaging in discussion in topical UU groups has taken some of the energy away from public blogging. While it is great to have these forums, there was some worry expressed in having these conversations moved behind closed doors. There’s been amazing UU outreach done over the last year via social media, especially on Facebook using combinations of striking visual images and quotes. The biggest contributors have been the page (featured in UU world this Fall) & , and Thomas Earthman’s I AM UU page. I don’t have stats on the counts from previous years, though I’ve logged these numbers for future comparison. Hashtags: Though they are now more mainstream, I don’t see many Unitarian Universalists using them well. Some do, but not overall. There’s huge potential to bring our congregations, clergy and other UUs on Twitter into larger conversations using hashtags. Hard to say if it is lack of technical understanding, or simply lack of intention to reach out. Gini’s Twitter Lesson: At the UUA’s 2013 General Assembly then moderator Gini Courter gave the full plenary a brief Twitter lesson. It was great to see this attention brought to social media at GA. The UU video site I curate, http://www.unitarianuniversalism.tv now has over 2450 UU videos. Alas, many are poorly filmed, and are designed for viewing by existing members chained to their pews. Unless someone is already a member or friend of the congregation, you have maybe 3 to 5 seconds to grab their attention. Many of the sermon videos posted online take 3 to 5 minutes, an eternity for a web video. Also, many congregations are not titling their videos or tagging with keywords which reduces their value. Titles, descriptions and keyword tags will greatly increase the reach of the videos UUs are presently producing. I’ve had many inquiries from congregations wanting to take their video to the next level (or to start filming) in 2014, which is encouraging. I still advocate for starting with an awesome podcast and periodic video messages designed for outreach (a message from your minister speaking directly to viewer online), and then getting into video of sermons. There are approximately 20 active UU congregations and UUA accounts on Pinterest. A search for “Unitarian Universalist” results in ~35 related boards. Numbers are approximate as some appear to not have been used since creating some time ago. I’m getting circled more often by UU’s but I don’t know if people are really using Google+ more or are just being forced to create accounts to use Google services. As for congregations, a search for Unitarian results in ~90 UU congregations (with profile photos) on Google+. Searches for Unitarian Universalist yields fewer number, and Universalist fewer still so “Unitarian” seems best for tracking the trend at this point. What are your observations on 2013? And your hopes and dreams for UU Social Media in 2014? The year in review: UU social media in 2013. I just ordered a new book on humanism, our UU theology, and the history of our association, REGAINING BALANCE: THE EVOLUTION OF THE UUA by Michael Werner, published by Religious Humanism Press. I’m excited for this read as this relates directly to conversations we’ve been having in the UU Growth Lab over the last two years, especially last month. I haven’t read it yet, so I can’t recommend it yet. But stay tuned! I’ll let you know what I think. If this subject is of interest to you, you may order it here. Below you may find videos of a lecture by Werner. and an adjunct faculty member of the Humanist Institute. He supports a balanced Humanism of heart and mind, reason and compassion and a balanced Unitarian Universalism that helps us discover how to be more fully human.